The 6300VNL for AT+T is a high performance fixed wireless communicationsplatform with advanced software enabling high availability, reliable and secure connectivity. Limited Time Offer Order a router and get 2 months of 1GB data FREE! (A $50 Value) just add router to cart and data plan will be included. 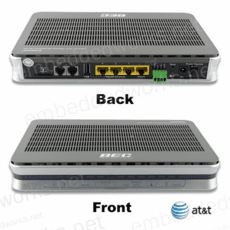 Features Dual-WAN(4G/LTE) and Ethernet WAN EWAN), 4-port Gigabit Ethernet Switch,Carrier-grade 802.11n access point, Voice over IP, USB, dynamicrouting and a robust Firewall.